BRAIN Work originally started as an advanced form of Lymphatic Drainage Therapy (LDT), a technique developed by French Physician, Bruno Chickley. BRAIN Work can be highly effective for persons who have experienced head injury due to Falls, Concussions, Strokes, PTSD, Auto Accidents and more. The techniques balance brain structures, facilitate fluid flow through the brain compartments and help balance brain components and communication pathways. Very Gently, subtle work with Profound Results! CranioSacral Therapy is a gentle, powerful technique that is effective in releasing neck pain, back pain, and mental stress (among other things). It does this by optimizing the movement of cerebrospinal fluid through the spine and around the skull. Developed by physician William Sutherland, this therapy provides a very soothing and relaxing healing experience. Deep Tissue Massage is a form of bodywork that aims to relieve tension in the deeper layers of tissue in the body. Deep Tissue Massage is a highly effective method for releasing chronic stress areas due to misalignment, repetitive motions, and past lingering injuries. Due to the nature of the deep tissue work, open communication during the session is important. Please be aware that soreness may occur after the treatment. You may also find that water can be useful after the session to improve circulation of blood, thereby facilitating movement of and removal of toxins, released from the deep tissue during the session. Energy Healing. 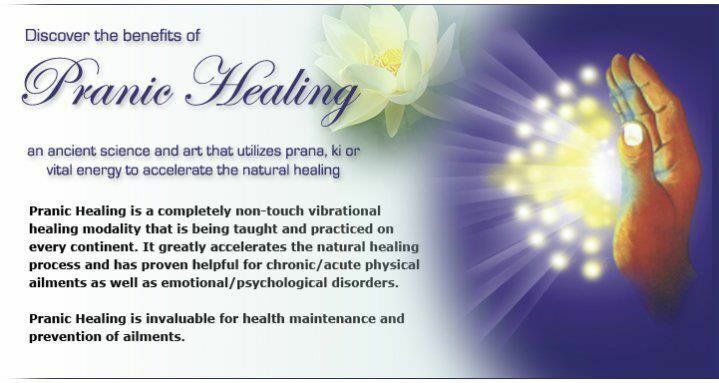 Pranic Healing is an Energy Healing Method that is based on two principals: 1) the body can heal itself and 2) "life force" energy, ie PRANA, CHI, KI, etc, is needed for the body to be alive , to have Vitality. All who live life experience emotional stress, mental pain or suffering and/or physical trauma or illness. These challenges can cause IMBALANCES in any or all of these areas; Mentally, Physically, Emotionally and Spritually. The Pranic Healing Practitioner works directly with your bio-electric or Energy field using a Method which restores balance and flow to your entire energetic system and falcilitates healing in the body. When the energetic template is strong and healthy, the physical body tends to follow. Pranic Healing is a no touch system of energy healing developed by Choa Kok Sui. Lymphatic Drainage Therapy (LDT) gently and rhythmically facilitates the movement of the Lmphatic Fluids (Lymph) through the body, especially swollen areas of the body, relieving pressure and enhancing the functioning of the immune system. As both a preventative and remedial technique, LDT can be used for a wide range of purposes including faster recovery from injury, reduction of swelling and discomfort from pregnancy, and strengthened resistance to illness. Myofascial Release is a form of soft tissue therapy intended to eliminate pain, increase range of motion, and re-balance the entire body. It does this by using massage techniques to refresh the fascia and release the bonds that exist between the fascia, muscles and bones. Fascia is the connective tissue that connects and covers all muscles, organs, and skeletal structures of the body. Direct myofascial release is sometimes known as deep tissue work. Indirect release applies light pressure. Both allows for increased blood circulation, greater ease of motion and relief from pain. The AromaTouch Technique (ATT) is a simple method of applying doTERRA’s Certified Pure Therapeutic Grade™ (CPTG) essential oils topically to produce a profound whole-body wellness experience for recipients. ATT affects four systemic constants of daily life (stress, immune function, inflammation and pain, and restoration of balance and homeostasis. ATT involves appplication of Eight (8) different essential oils assisting those who are experience stress, pain, or illness. ATT can be a simple, yet powerful method for facilitation of restored health and well-being. Aromatouch was Developed by Dr. David K. Hill , chief medical officer of doTERRA. Muscle Release Therapy (MRTh®), is a therapeutic form of massage that balances/realigns your posture. MRTh® is customized to your body's areas of need based on your intake assessment each appointment. This balancing/realignment process "reset" your body's natural functioning and restores it's ability to move more fluidly, work more efficiently, and do so with less pain and discomfort. MRTh® works by releasing the ligaments and muscles that support the body, instead of focusing soley on secondary issues like knots, tense muscles, joint pain, etc. so that these can return to their natural resting positions on the skeleton. In turn, this allows the structures they support, to return back to their aligned positions, thereby eliminating postural tension and benefiting a significant number of body issues. The experience itself is very unique. Muscle Release Therapy (MRTh®) is usually is performed over the clothes with a light touch. Although light, the touch affects the soft tissues very very deeply and repeatedly results in amazing changes for a wide variety of conditions. Since the treatment involves a light but deeply effective touch, treatment applied immediately after injury or trauma, often leads to a faster, smoother recovery while treatment for prolonged chronic conditions also respond quickly to application of MRTh. Life, no matter how we live it, involves use of the body. Often we often use the body in ways that forces it to adapt or compensate in order to continue moving. These adaptations/compensations, although they keep us moving, in the long run, repeatedly result in tensions/pulls since the body is no longer functioning in alignment with the ways the stuctures were designed to work. This ends up "costing" us in pain, joint disease/degeneration, and general "slowing down". Muscle Release Therapy (MRTh®) functions like a "reset button" that not only restores alignments but eases/smooths function by "resetting" the system. MRTh® was developed by Dennis Gibbons, Founder of the Gibbons School of Massage, Dennis developed this work as a solution to his realization that people needed something else to heal, the modalities he was using werent solving all the problems. Dennis was recently inducted into the Massage Therapy Hall of Fame, Dennis is a brilliant, caring, innovative, instructor and mentor. I feel exptremely grateful to have studied with him and to have the opportunity to continue to mentor with him. The Meditation on Twin Hearts (MTH) is a Meditation that is unlike other meditations. For the practitioner, the practice of this meditation “washes” out stress, irritability and diseased energy. It then re-energizes the body immensely. For the Earth and all the peoples of the earth, the Meditation blesses all for peace and healing and sends healing energy for regeneration of Mother Earth. We humans have really been quite ignorant for a long time about how we influence the health and well-being of the plant we inhabit. Without good air, good earth and good water, we cannot survive. We gather every monday between 6:00pm-6:15pm then collectively do the Meditation Twin Hearts Meditation together. From 6:45pm-8pm we offer healing sessions . Come experience vibrational healing. WE look forward to meeting you.